Today, in 2019 prisoners languishing in one of UK's prisons and afforded the privilege of making a telephone call are given a Personal Identification Number (PIN) to enter into a Her Majesty's Prison Service, Scottish Prison Service or Northern Ireland Prison Service blue (keypad and handset only) prison phone. 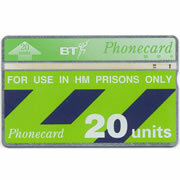 Pictured above - Final issue BT Phonecard for use in UK Prisons only , the card was issued in 2003. 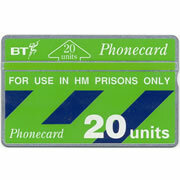 However, between 1987 and the early noughties (2003/04) prisoners were issued with British Telecom (BT) Phonecards to use with cardphone payphones to make telephone calls to friends and family. Prisoners in England, Wales and Northern Ireland were issued with H.M. (Her Majesty's) Prison Service Phonecards, while in Scotland, SPS (Scottish Prison Service) Phonecards were issued to inmates. 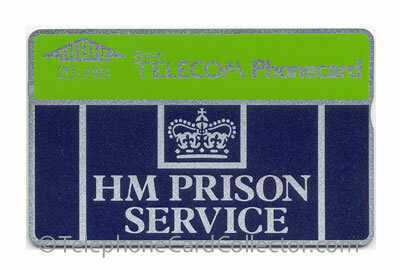 During the time that BT Phonecards were used within UK Prisons millions of BT Phonecards were issued. Read on for a definitive guide to the telephone cards that were used to make calls from within UK prisons. Pictured above - Screenshot from ITV 1990s Prison based fictional television series: Bad Girls - "Oh What a Night", Series 2, episode 13. 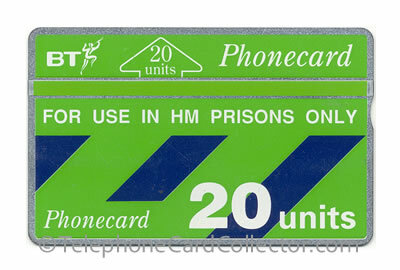 HM Prison cardphone pictured in use in the background. 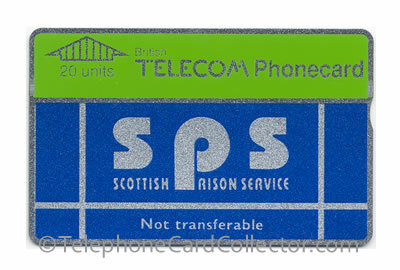 Initially, from their introduction in 1987 to early 1989 publicly issued British Telecom Phonecards were used within Prisons in England, Scotland, Wales and Northern Ireland. 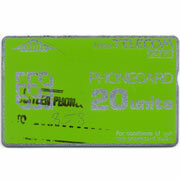 These cards were issued by Phonecard manufacturer Landis & Gyr. 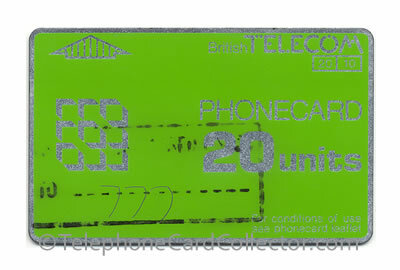 The vast majority of these Phonecards being definitive 'greenie' issues (like the example below) and consisted of mainly 20unit, but also 10unit Phonecards. Pictured above - Home Office hand stamped 40 unit BT Phonecard for use in HM Prisons. BT Phonecards (like the example above) were hand stamped locally within Prisons with "Home Office Official" to differentiate them from smuggled pubic BT Phonecards. However, a large number of these cards are known to have received either a genuine hand stamped impression (presumably 'by favour'), or, in some cases, a completely fake hand stamp was applied by other persons to ordinary cards. 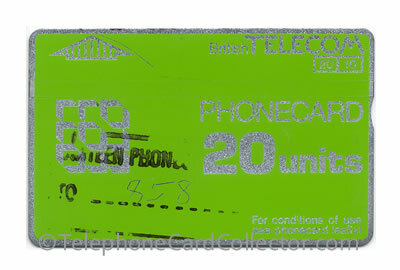 With this in mind British Telecom and telephone card manufacturer Landis & Gyr modified cardphones located in HM and Scottish Prisons to only accept specially encoded BT Phonecards. 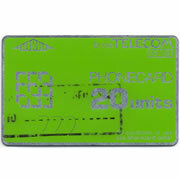 The first of these telephone cards were issued in 1989 (as pictured below). 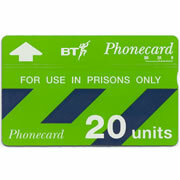 No longer could publicly issued BT Phonecards be used in cardphone payphones located in UK Prisons, thus preventing the use of smuggled public BT Phonecards being used and sold at inflated currency in prisons by inmates. Pictured above - HM Prison Service use only: specially encoded BT Phonecards first appeared in 1989. 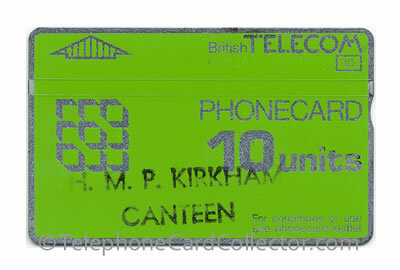 Telephone cards were used in Prisons throughout England, Scotland, Wales and Northern Ireland to enable inmates to make telephone calls. While millions of cards were issued and most of these were very much generic, there are often exceptions to the rule. 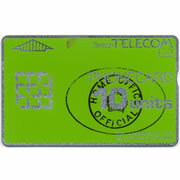 To read about one such example where a Telecom Portugal 120unit Phonecard was used and overprinted with HM Prison card design read more. 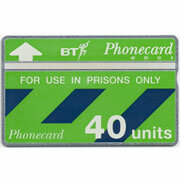 The very first telephone cards to be used in UK Prisons were locally sourced public issued BT Phonecards. An official hand stamp e.g. 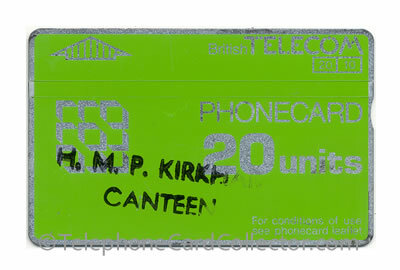 'H.M.P KIRKHAM CANTEEN' or 'HOME OFFICE OFFICIAL' were then applied to the Phonecard by the Prison where the cards were destined to be used. Below are six examples. 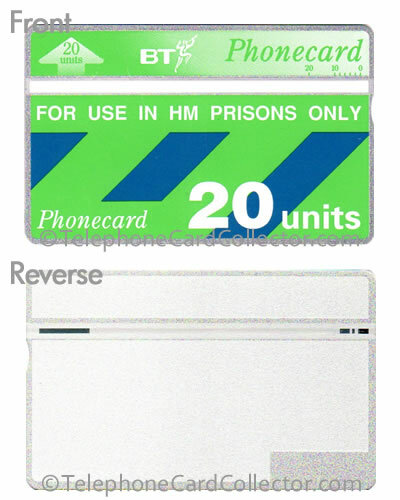 In 1989, specially designed and encoded HM Prison Service branded BT Phonecards started appearing in prisons in England and Wales. 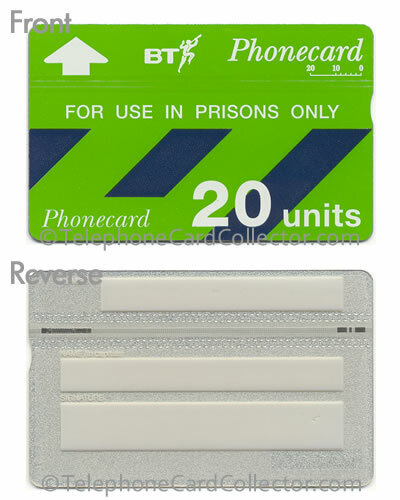 This change was due largely to prevent the use of ordinary public BT Phonecards (as pictured above) from being smuggled into UK prisons and then used as an inflated currency in prisons by prisoners. 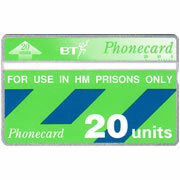 All cardphones in UK prisons were modified by British Telecom (BT) engineers to ensure that only the new HM Prison Service telephone cards could be accepted and used. 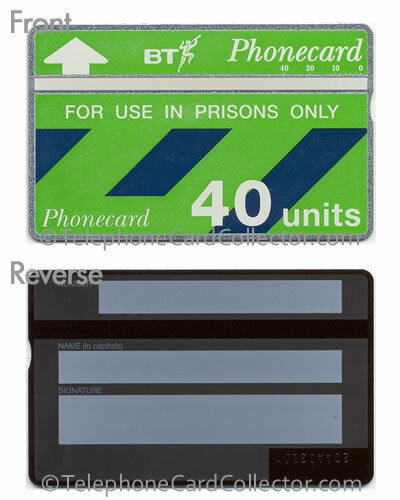 In total there were three distinct and different designed BT Phonecards that were used exclusively in both Her Majesty's (HM) and Scottish prisons between 1989 and 2003 (Scottish Prison Service cards started appearing in 1990 - as pictured below). 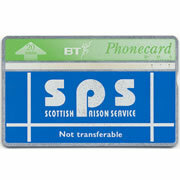 Pictured above - SPS (Scottish Prison Service) BT Phonecard, these cards could only be used within prisons in Scotland, UK. 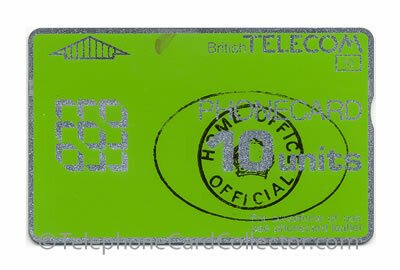 While just three distinct designs were issued there were a total of ten different issued and catalogued BT Phonecards, many with varying subtle differences. Many of the designs changed very little over the years with some designs being used for 10 years. 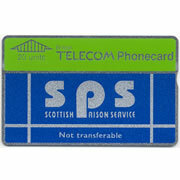 The ten different HM Prison Service (HMP) and Scottish Prison Service (SPS) BT Phonecards along with their catalogue numbers e.g. CUP001A are shown below. 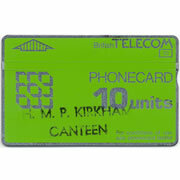 To view a larger image simply click the picture of the card below. In addition, and where applicable reverse printing is also shown. The reverse printing of later Prison cards enabled the prisoner to write his/her; prison number, name and signature. 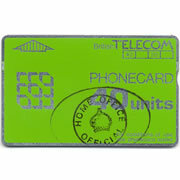 Below the pictured telephone cards is more information relating to each issued card. Listed below are known Prison BT Phonecard control numbers, if you know of a control number that is not listed below please email me details and I will add it to the list below. What is a control number? Learn more. 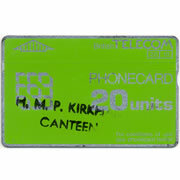 The cards catalogue reference number e.g. CUP007 is listed first, followed by the known control number prefixes. CUP stands for Closed User Group Prison. CUP001B - 906B, 907C, 932F, 932G, 024H, 050C, 070D, 051D, 141D, 161F, 161F, 144C, 144G, 106G, 106K. CUP001C - 950E, 950F, 932F, 932G, 042H. CUP002 - 051D, 161B, 143D, 143E, 126D, 150C. CUP003 - 226E, 227G, 249B, 231K, 302A, 343A, 344D, 347D, 350H, 372D, 441H, 442G, 463A, 444F, 450E, 466E, 407K, 449B, 431C, 432E, 561C, 542B, 527A, 528A, 548G, 548H, 530E, 571C, 571D, 623D, 625C, 608A, 609E, 610E, 611G, 612L, 702H, 703H, 704F, 704F, 707F, 708G, 709G. CUP004 - 127A, 127B, 127H, 110B, 130G, 221B, 261B , 261H, 262G, 262L. CUP005 - 282B, 282C, 225D, 225E, 206B, 206C, 246H, 246L, 266A, 266C, 248C, 248F, 268A, 229B, 229K, 231A, 231D, 212E, 212F, 212G, 212K, 212L, 302B, 302C, 302D, 323C, 323D, 323H, 326B, 326C, 307A, 307C, 331G, 351A, 351B, 351C, 351E, 352G, 352G, 352K, 441D, 441E, 441G, 461A, 402C, 402F, 402G, 482B, 482C, 423C, 463D, 463E, 404C, 404G, 404H, 464H, 464K, 445G, 465A, 465B, 465C, 465E, 466D, 466G, 447D, 408D, 408E, 448B, 448D, 448E, 448F, 409G, 409G, 409H, 409K, 409L, 430C, 450H, 411A, 411B, 412A, 432F, 432G, 432H, 432K, 432L, 501C, 501D, 501E, 501F, 501G, 521A, 521B, 541K, 561D, 561F, 522F, 522G, 522L, 542D, 503A, 503B, 543K, 563A, 563C, 505H, 505K, 525A, 525G, 546E, 546G, 564H, 546K, 546L, 586C, 586D, 586F, 586H, 507C, 507D, 507E, 508H, 508K, 508L, 528C, 548C, 548D, 548E, 548F, 548H, 529D, 529E, 569G, 569H, 569K, 589A, 589B, 589C, 589D, 510C, 530H, 530K, 530L, 570D, 511C, 511D, 511E, 511F, 511G, 511K, 512E, 512F, 512G, 532D, 532E, 523F, 552A, 552B, 552C, 601B, 601C, 601D, 602A, 602B, 603A, 603C, 604B, 624A, 624F, 624H, 605A, 605B, 605G, 605H, 605K, 605L, 609B, 610B, 611A, 701A, 701B, 701C, 701D, 702C, 702F, 703A, 703B, 703D, 703F, 704A, 704B, 704C, 705D, 706A, 706B, 707B, 707C, 707D, 708A, 709B, 709C, 709F, 710A, 710C, 710D, 711A, 711D, 712B, 712C, 801C, 803A, 803C, 823C, 843B, 804A, 804C, 804D, 805A, 807C, 808D, 809D, 809E, 810A, 810G, 811D, 811F, 812D, 812F, 901D, 902A, 902D, 902E, 904A, 905B, 905C, 905E, 905F, 906E, 906F, 907A, 907C, 010G, 012A,106B, 106G, 107A, 107C, 109C, 109F. CUP006 - 225B, 225C, 266H, 231A, 343B, 308H, 349F, 330B, 351G, 421L, 403H, 443L, 446E, 468A, 449E, 431G, 432C, 542G, 525B, 506B, 508D, 509E, 510H, 510K, 512E, 512F, 512G, 643F, 625D, 609D, 610D,701E, 704E, 107K. CUP008 - 110C, 111C, 202C, 204A, 207C, 208F. 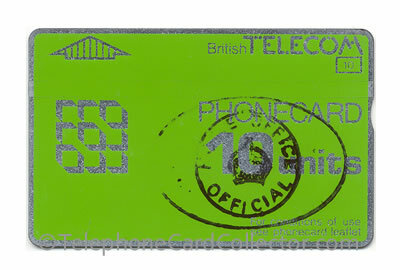 BTS005 - 806L (this final batch of British Telecom Service Card was produced in June, 1998 specially to enable BT engineers to service BT optical Landis & Gyr cardphones located in UK Prisons. 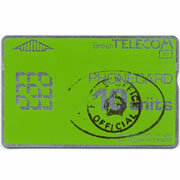 In 1996/7 public cardphones were superseded by new chip card technology). 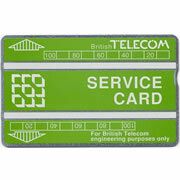 The Service Card is pictured below. 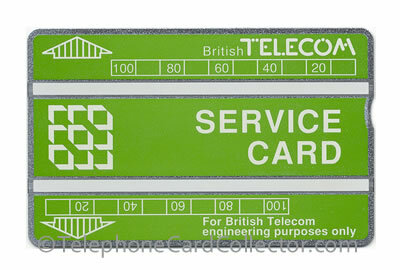 Pictured above - Final issue BT Service Card issued in June 1998 and produced in Switzerland, following the closure of the UK Landis & Gyr Phonecard factory in Acton, North London, England, UK. 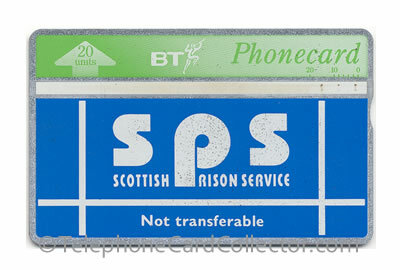 Before BT Phonecards were used into UK prisons to enable inmates to make telephone calls, prisoners would use cash based payphones. The most common payphone used was coin telephone boxes 700, similar to those used in rented properties e.g. hotels and the like. Prisoners were allowed to earn money in jail to use in them, and if they were good they were allowed to make calls, there would only have been one or two payphones in those days - 1970s and early 1980s. All telephone calls were always recorded onto a cassette tape system. 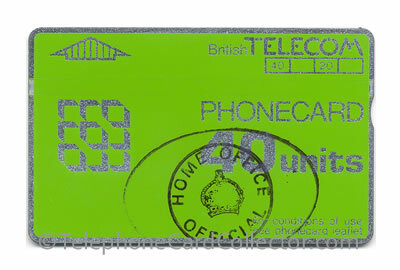 Fast forward to 2019 and the cardphones which had different software to stop ordinary BT Phonecards being smuggled in have all long been replaced by a PIN Phone (keypad and handset only). You can read more about the criteria and usage by inmates using the PIN number based payphones in UK. As a keen fusilatelist (telephone card collector), I'm keen to collect all the different Prison Cards that were produced and used or intended for use (in the case of mint unused cards) in UK prisons. 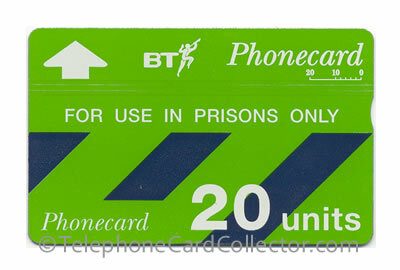 I'm especially interested in adding to my collection of early hand stamped Prison BT Phonecards. 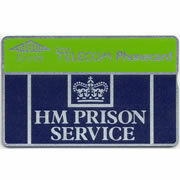 Should you have these or other H.M. Prison cards to swap, sell or giveaway, please contact me. In addition, if you have images or content that you'd like to contribute towards this webpage please do contact me with information, scans or photograph. 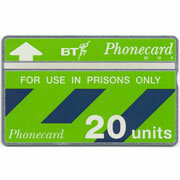 Finally, as an extra resource please view the special Pinterest board focusing on BT Prison Phonecards. 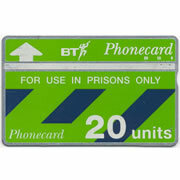 Follow Telephone Card Collector's board BT Prison Phonecards on Pinterest.